The Force is strong with this gym. You will be too if you train there! I'm a huge nerd, and I'm dang proud of it. I ain't even ashamed to admit that when I was a kid, I'd drape a twin-sized bed sheet over my shoulders and run around, making swoosh noises and pretending to be as strong, fast, and unbreakable as Superman. Even now, when I work out in the gym, I think to myself, "How much would Iron Man lift?" 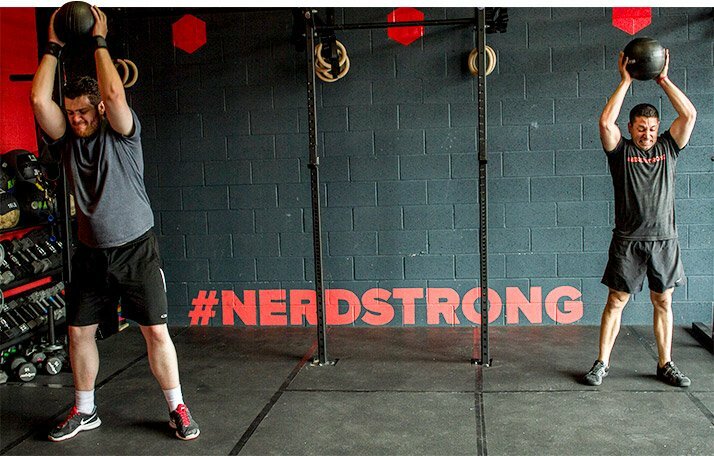 Imagine my delight, then, when I discovered a really awesome gym that appeals to both my fitness and nerdy sensibilities: NerdStrong Gym, nestled within a small warehouse space in southern California. This gym resembles a CrossFit-type space with bumper plates, kettlebells, squat racks, and pull-up bars strewn throughout. But the gym's nerdy character quickly reveals itself in the form of D20 (that's a 20-sided die) light fixtures, comic-book-inspired posters, and the gym's motley residents, most of whom proudly sport their favorite nerd-related garb and accompanying accessories. Operated by Andrew Deutsch and Marla Hudnall, along with their ragtag team of certified coaches, NerdStrong Gym aims to let me and many other fellow nerds live out our superhero fantasies, sans the makeshift cape. They help us train our bodies to actually become stronger, faster, and less breakable in a friendly, noncompetitive environment. That's not to say people aren't competitive here; what matters more to Andrew and Marla is that people are finding fitness to be a fun and rewarding experience. To that end, the NerdStrong staff ensures that the training classes and programs aren't your run-of-the-mill, hypercompetitive workouts that only someone like the Incredible Hulk could excel in. 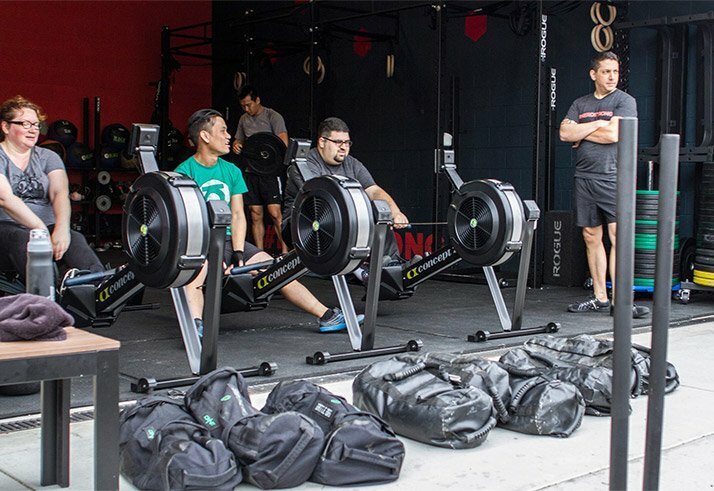 The NerdStrong staff ensures that the training classes and programs aren't your run-of-the-mill, hypercompetitive workouts that only someone like the Incredible Hulk could excel in. "Every Sunday, we do a themed workout of some type, such as our Indiana Jones workout, where a boulder will 'crush' the athlete if they fail to finish a workout in a specific time," says Andrew. "Our Star-Wars-themed workouts have Rebels and Sith battling for the Death Star. During our Godzilla workout, Godzilla attacks every five minutes, and if the athletes haven't completed the reps in that 'city district,' they're crushed—metaphorically, of course." I had the pleasure of participating in one of NerdStrong's nerd-infused workouts. On this day, the coaches quite literally showed their cards with a workout called "Battle with The Royal Flush Gang," a reference to the playing-card-themed supervillains from DC Comics' Justice League universe. The workout's premise is simple: Each of the four suits and joker cards within the deck of cards were assigned to a specific exercise: push-ups, bicycle kicks, air squats, sit-ups, and sprints. The dealer revealed one card at a time, and everyone had to perform the exercise and number of reps as specified by the card. If the dealer revealed a 12 of spades, we'd all drop for 12 push-ups. Some cards turned out to be more benign than others, but it largely depended on the luck of the draw. This goes on for as long as it takes to get to the very... last... card. Audible sighs of relief resounded through the cozy workout space when lower numbers were drawn; conversely, grunts of disapproval could be heard when higher-value cards appeared. 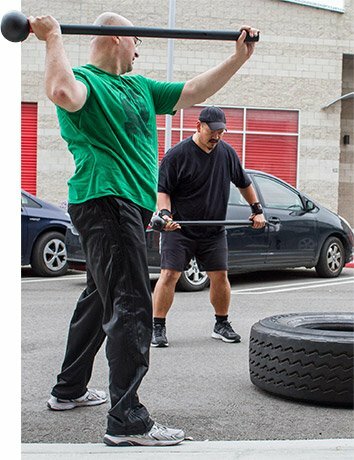 Despite occasional grumbles, everyone completed their exercises to the best of their ability, and many continued to challenge themselves by modifying the exercises if they felt too easy. It's commonly understood that summer means bikini season. NerdStrong flips this notion on its head: "I've told others that Nerdstrong doesn't have a bikini season, we have a Con season," says Andrew. Con season, of course, refers to the numerous geek-centric conventions—such as the famed San Diego Comic-Con, Penny Arcade Expo in Seattle, and BlizzCon in Anaheim—hosted at various cities throughout the year. People from all walks of life come together to celebrate geek culture and be themselves—whether they choose to do it as themselves or dressed up as their favorite character from a TV show, a comic book, or a video game. "Sadly, we don't entertain costumes at the gym during workouts because that can make them unsafe," says Andrew, "but we have some members who will forgo a workout because they need to sew all night, hammer out some metal for armor, or make their own chain mail. Being more fit lets them feel more confident walking about the convention floor in sometimes revealing costumes." Inclusion is one of NerdStrong's leading tenets. 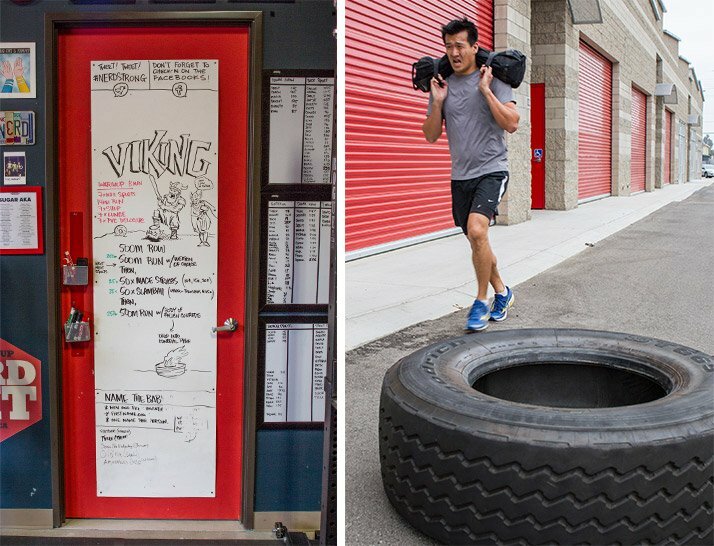 These days, CrossFit-style workouts and boutique gyms are a dime a dozen, but NerdStrong Gym distinguishes itself by offering a welcoming and friendly fitness environment to those who've always been intimidated by traditional commercial gyms. Its strong sense of community reinforces the idea that anyone can break stereotypes, improve their self-esteem, and become a superhero. Nerdstrong's strong sense of community reinforces the idea that anyone can break stereotypes, improve their self-esteem, and become a superhero. Plus, they can get in shape and bond with folks who share their same passions. "There are non-gym-related activities, like board-game night and tabletop gaming groups that use the gym as their playing space," says Andrew. "We have movie nights and next-day workouts based on the movie. Everything a nerd might be into, we want to encourage."